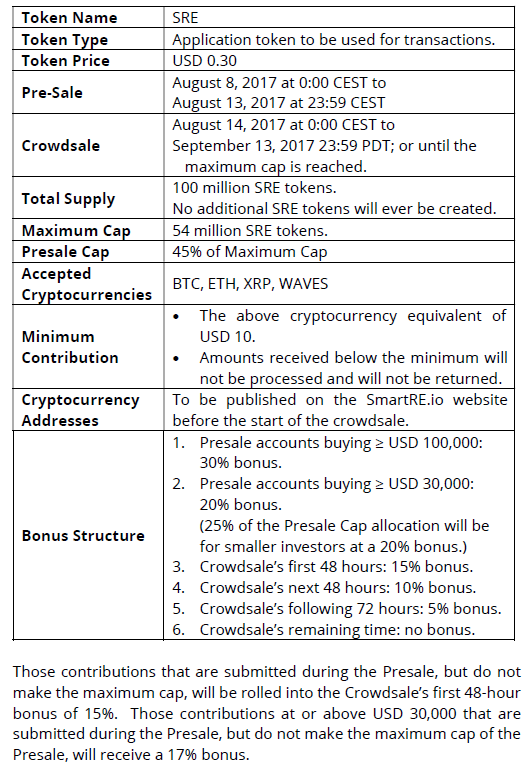 The SmartRE ICO Presale will launch on August 8, 2017. SmartRE is bringing a revolutionary way for people to get access to the value of their homes by selling fractions of the appraised value to buyers who use the SmartRE tokens issued during the SmartRE ICO. We will include the complete abstract from the whitepaper, which is not our common practice, and then explain the mechanics of the SmartRE solution. SmartRE identifies two needs for its platform, the first for the homeowner and the second for those with investable money interested in the Real Estate opportunities in the US. A major issue facing many residents in the US is the cost of purchasing a home and the load of debt they take on. Not only do they have mortgage payments to pay but the majority have other debts including credit card, Automobile, student loans and other debts. The question and problem they have is how to obtain additional cash without falling deeper into debt. Unfortunately, the only way to do that is to take another loan from the bank, remortgage or possibly a home equity line of credit. This solution doesn’t really address the issue as the debt load increases as do the monthly payments on the total debt. 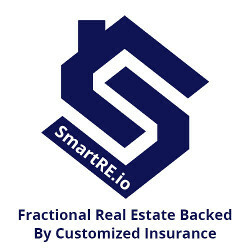 SmartRE has identified that there are millions of people around the world, they focus mainly on China, India, Mexico, Canada and the UK, countries with citizens that invest the most in the US, that have some investible money and are interested in investing that in the American Real Estate market. We are not talking only about the millionaires and multi-millionaires, but even those that have a dollar or less that they would like to use to participate in the US Real Estate market and can’t in a normal situation because their funds are too low for traditional investing. The question is, how can we allow these individuals, whose total investable money is in the billions to get into the US Real Estate market? SmartRe realized the opportunity to use the Ethereum Blockchain and its smart contracts to invent a new model. This system would allow the homeowners to put a portion of the value of their home on the platform and find buyers to put fractions of the equity of the homes through the usage of the SmartRE Token. The maximum allowed for the homeowner to put up is 49% of the equity he owns so that he keeps the majority of the ownership and has a vested interest in keeping the home in good shape. The interested investors from around the world can now buy a piece of the equity in US real estate by purchasing fractions of a given home. The upfront capital limitation no longer keeps them out of the market as one US Dollar is enough. They can join in the appreciation of the US real estate market. The smart contracts are stored on the blockchain and given addresses from which to execute. Potential examples include Escrow. Once two parties agree to the conditions of the escrow, it can be written as a blockchain smart contract. Each condition can be codified to be input into the smart contract as it is satisfied. After all of the conditions are met, the resources are released to the respective party. Since the smart contract is a neutral trusted party under no one’s control and agreed to by the parties involved, it is the most efficient way to execute an escrow process. Exchange Market. It is a subset of an escrow as the condition is that Party A sells to Party B; so Party A receives Party B’s funds only when Party B receives Party A’s product. It is easily done when the funds and products are digitized and sent to the smart contract. There is no need for a third party middleman that can be corrupted or make mistakes. Once the products and funds are processed, the settlement occurs nearly instantaneously, without a confirmation timed delay, e.g., T+3 of the stock market. Legal Verification. Digitization of anything, from signed documents to forensic evidence, can be unchangeably stored. Later, when a legal discovery process is initiated, the data can be trusted as untampered because the blockchain is immutable. There are two sides to the application, the homeowners, and the buyers. Mandatory up-to-date homeowner’s insurance, and a good credit score. Determine the amount of Equity Stake they want to put on the market. Homeowners can only liquidate up to forty-nine percent (49%) of their equity stake as stated above. From the buyer’s side it is simple, they chose the properties that they are interested in and are required to put down cash or general tokens such as ETH, or BTC to ensure that they don’t lock up the opportunity for other buyers who may be interested. If the minimum requirement of funding (5%) is not met all funds are returned. Let’s take a step back, for each home that equity is put up for contributions, an ERC20 token is created for that specific token. This allows for the buying and selling of pieces of these properties between buyers. The buyers can make money in one of two ways. They can sell their tokens to other purchasers if the purchaser values the property specific token higher than the market price f that token or they receive their proportion of proceeds from the sale of the property of which they hold the property specific token. If however you do not use the SRE tokens purchased through the crowdsale but use other modes of payment you do not get the discount. In this way, the tokens are “utility tokens” in they are just offering future use of the SmartRE platform.